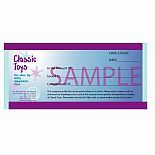 Easy Gift Giving with Classic Toys gift certificates! 1) VIA USPS - We are happy to mail a gift certificate to anyone in the United States. Pick the amount from our pre-priced choices. No charge for postage! 2) LOCAL IN-STORE PICKUP - We can produce a gift certificate for in-store pickup (just select "Local pickup at Classic Toys" at the time of check out).